A recent, unfortunate trend in movie trailers is how many plot and character twists get featured in a three-minute highlight reel. 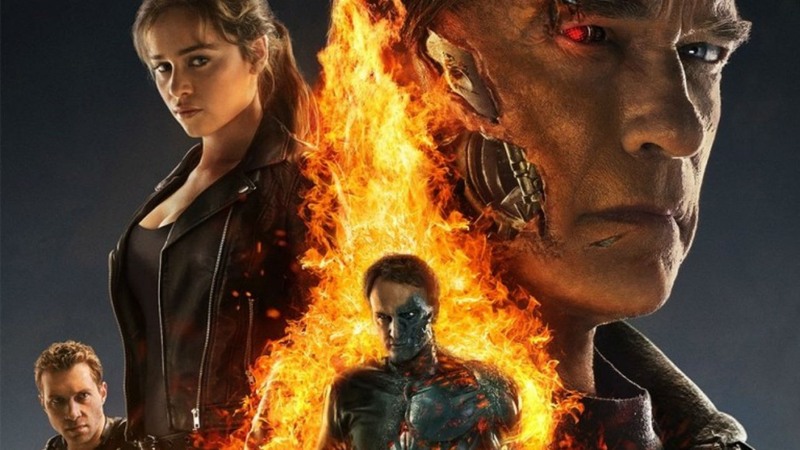 Anybody who arrived early to a movie showtime in the last three months saw the preview clip for Terminator Genisys. I advise against viewing the trailer if you intend to catch the newest entry in the Terminator franchise, but this is the only way the ticket price earns full value. Despite a growing stigma for blockbuster franchise sequels, Terminator Genisys powers forward—following its own advice through the recurring “don’t look back” motif. Director Alan Taylor’s (Thor: The Dark World, “Game of Thrones”) most recent motion picture proves the worthiest sequel to James Cameron’s original entries. Terminator Genisys never quite touches the classic status of The Terminator or Terminator 2: Judgment Day, but holds its own for a blockbuster sci-fi movie. Taylor recreates well-known scenes and situations out of the established timeline and adds his own creative twist to the course of events. He takes a chapter from the book of Cameron and delivers a well-paced action movie with time travel elements which get explained in a brief quantum theory lesson at one point by “Pops” the Terminator, still played by international film icon Arnold Schwarzenegger after 31 years. The biggest drawback here is: Why is this film necessary? In regards to the Terminator story, it simply isn’t. The plot is very much contrived in an attempt to continue cashing in on the “Terminator” name. Paramount Pictures have completely rewritten Sarah and John Connor’s respective character arcs to give reason for another movie. A cavalcade of newcomers in familiar and new roles joins Schwarzenegger. The new protagonist is no longer in the Connor family, but they are heavily involved. Instead, Taylor follows time-travelling resistance soldier Kyle Reese on his life- and future-changing journey to the past and back to the future again. Jai Courtney (Jack Reacher, A Good Day to Die Hard) plays Reese with heart and soul—an apt pupil to Jason Clarke’s (Dawn of the Planet of the Apes, Lawless) John Connor. On Reese’s anticipated trip back in time, he’s surprised by Schwarzenegger’s Terminator and a rather prepared Sarah Connor, played with the necessary amount of emotional intensity and light sense of humor by Emilia Clarke (“Game of Thrones,” Dom Hemingway). Oscar-winner J.K. Simmons (Whiplash, Sam Raimi’s Spider-Man trilogy) appears in a few scenes as a sloppy, boozy detective with a hunch about the time-travelling suspects in police custody. Taylor doesn’t focus on building the Terminator’s relationship with any of the characters like Cameron implemented for Judgment Day. Instead, Sarah and the cyborg have a well-established connection from their first scene together and rarely have a scene without the other. Schwarzenegger downplays the titular character in this film, only appearing for action scenes and comic relief. He serves as a father figure of sorts for Sarah Connor without delving too deeply into the story. Think of R2-D2, C-3P0, and Chewbacca rolled into one character. The Terminator, like Schwarzenegger, has visibly aged over the years and must constantly fight against the newest, deadliest model of itself to survive. “Old, not obsolete,” he reminds Kyle Reese. Despite a lack of necessity by Terminator standards and invalidating some of the very events recreated by the filmmaker, Terminator Genisys holds its own as a fast-paced sci-fi action blockbuster. Excellent, intense cast performances translate well to the screen—making viewers wonder just how much of their own trust to place in the ever-advancing world of technology. Alan Taylor dares to reboot Terminator and send it in a new direction. Most importantly, avoid the trailer! Watch this instead of the trailer before catching the movie!